The adoption of Green ICT by business is far more than just the acquisition of low-carbon emitting solutions, green hardware and implementing software to switch-off computers in periods of inactivity. Although such changes are necessary actions, Green ICT is about a strategic business transformation in response to both markets and legislation because it is good for business. Such transformation requires a redefinition of business processes, a realignment of information exchange, integration of unified communication, and above all, changing the business model to align with evolving business trends and market opportunities. Beyond the marketing benefits that accrue to a business from the use of Green ICT, the adoption of Green ICT allows businesses to lower costs and improve service delivery, while simultaneously addressing environmental footprint. Operational gains and market opportunities are the business drivers to overcome the incumbency of replacing utility infrastructure and the knowledge worker assembly line that ICT provides to business. 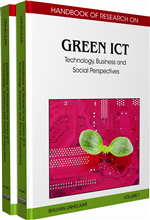 This chapter discusses aspects of the strategic business transformation associated with the adoption of Green ICT within businesses, including the significance of information exchange for green business operations. As discussed by Sherringham and Unhelkar (2008a), business responds to legislation, customers, market forces and costs (suppliers). Depending upon the nature of the business, the impact of changes in any of these areas can have major impacts on both the structure and dynamics of business. Markets are often highly volatile and rapid response capabilities are the order of the day within business. Superimposed upon short-term markets are the longer-term trends that often require major business changes and restructuring to address. Therefore, Green ICT is set to play a key role in both the tactical short-term and in transforming businesses in the longer-term. Customers often respond “in-the-now” (respond instantly and on an emotional basis) and bring significant influence to short-term actions within markets. The role of Green ICT for business in customer-terms lies in two key areas. Firstly the marketing power of green-credentials for a business (discussed earlier by Ginsbert and Bloom, 2004) and secondly as a tool for driving change to realise lower costs and improved customer service. Though several elements impact the costs for business, it is the services from suppliers on both expenses and cost of goods that are of substantial impact on operations. When compared with customers, suppliers tend to be in a long-term relationship with a business. This relationship can offer opportunities to realise cost savings and improve services through the integration of systems. Green ICT can also be used as a tool for business optimisation and for lowering costs and improving service delivery through integration of operations, the electronic sharing of information and sharing common operational platforms. Changes to government legislation are often infrequent, but when they do occur, the impact maybe very significant, with considerable work in the areas of governance, audit, reporting and compliance regularly resulting. Given the timeframes involved around the implementation for and compliance with legislation, business is often faced with the need to implement tactical solutions to meet immediate needs, which may then become the incumbent or are replaced by longer-term solutions. Green ICT can be used to deliver both tactical solutions for businesses to meet legislative needs as well as enable longer-term solutions. Green Marketing: Using green and environmental credentials as a marketing tool to attract customers and gain market share. Value-of-How-To: A business model where video, webinars and podcasts are all used to explain an audience, at their pace, how to do things to influence decision making. Unified Communications: An integrated solution to communications delivered to any device anywhere anytime, including e-mail, messaging, video, imaging and voice. Information Exchange: The ability of ICT systems to be linked together and seamlessly share information across the enterprise and with external partners and agencies (voice, data, images, video, data feeds). Real Time Decision Making: The provision of information in context and integrated with work-flow in real time to any device anywhere anytime is needed so that decisions can be made.